Her work with Alex over the next three decades more than silenced the sneers. It fundamentally changed our understanding of animal intelligence, especially with regard to birds. Pepperberg’s first 25 years of research was collected in The Alex Studies (Harvard University Press, 1999, 2002). Those papers show a first-rate mind designing deft experiments to probe the parrot’s consciousness and demolish the popular stereotype of a “bird brain.” But the personalities of the two protagonists behind that work were largely hidden through the impersonality of science and until 2008 had been revealed only in scattered anecdotes and a few interviews. Alex and Me is the autobiography many of us have wanted to fill that void. Written for a general audience, Pepperberg’s narrative weaves together the story of her personal life, including family, friends and colleagues, with the intellectual development of her research, her professional struggles in the politics of academia for recognition and support, and through it all her deepening relationship with a complex, one-pound bundle of feathers and ganglia, who was as close a colleague as any human and in some ways was her truest life partner. The reader learns something about the scientist’s life and mindset from this book. But what emerges most is the common bond of ‘humanity’ that united these two, informed Pepperberg’s research, and no doubt contributed to Alex’s remarkable accomplishments. The young parrot was an Only Bird for his first several years under her care and received a great deal of human-like attention. Pepperberg taught him words by talking to him as a parent would to a toddler, always assuming he had an internal mental life with both a capacity for learning and a desire to communicate. What also emerges is a portrait of Pepperberg as a woman of intellectual integrity, personal strength and commitment. In many ways her tale is sad, even tragic; her epiphany—the recognition of her greatest strength—reveals itself at her moment of deepest loss. She recounts a rather lonely childhood, during which a succession of budgies often were her main friends, experiences that later must have served her well. Throughout her adult life, Pepperberg’s devotion to Alex and belief in her own work cost her mightily. She had to fight constantly for recognition, even respect, as well as for funding and facilities to pursue her work. And for pursuing it, she sacrificed a successful academic career, job security and financial stability. She lost her marriage for it. And because of her internal struggle to maintain a scientist’s objective distance from her subject, she could not fully grasp until the moment of Alex’s death how much she really loved him. Alex himself comes across as a complex personality. Pepperberg wistfully compares him to Denys Finch-Hatton in Isak Dinesen’s Out of Africa—someone who changes you but whom you can never have, never completely know. She characterized Alex as having the cognitive abilities of a four- to six-year-old child but the emotional maturity of a two-year-old. He could be bossy around the lab (she said he ran the place), a bully toward his flockmates, petulant when offended, uncooperative when in a bad mood or just bored with re-doing the same dumb problem so Pepperberg could get a statistically-significant sample. In some such cases, he repeatedly gave the wrong answers to her questions, throwing off her results (she knew he knew the right ones). Another time, when his repeated pleas for a nut were ignored as Pepperberg tried to make him perform for guests, an apparently exasperated Alex spelled out “nuh-uh-tuh! !” in the phonic syllables she had been trying to get him to use. Sometimes he also would become impatient with the other parrots in the lab, telling them to “Answer better” when they were failing Pepperberg’s tests. There is also sadness, as when Alex suffered illness (life-threatening aspergillosis, requiring surgery) and the inevitable episodes of fear, loneliness and deprivation. For me, one of the most poignant revelations was his love of a tree planted in the courtyard of the laboratory building where he stayed. He liked to shoulder surf down to look at it. I wonder whether his fascination expressed some hard-wired recognition of what would have been a central part of his life had he been a wild parrot. And if so, what did he see in the tree? Did he perceive it as beautiful? And was it mainly an aesthetic experience? Or did it call forth some ineffable yearning for another life? Did it make him feel sad, empty or unfulfilled? But it would be a mistake to pity Alex for the life he never had as a wild bird or even a companion parrot in an ordinary home. He was a complex being, and there is much we do not know about his happiness and interior life. He lived in a cloistered environment, to be sure, but not an empty or meaningless one. Every day he received love and care, attention and stimulation, friendship and community. Moreover, to pity him would be to deny his agency, the role he played in creating his own life. Whatever we believe, we should feel gratitude that Alex existed and that Irene Pepperberg chose to work with him. In the long run, their 30-year collaboration may have done more to improve the welfare of companion birds than any ten rescue groups could, simply by giving scientific validity to the perceptions and interpretations that countless people have of their birds’ intelligence and sensitivity. And in the end, Pepperberg the scientist finally acknowledges that her studies may have shown there not only is an intelligence in these birds which in many ways is the same as the intelligence we see in young children—that which we see in our own children and can sometimes recall from our own childhoods, an intelligence with which we can have a human relationship. By that very fact, there must be personhood behind it. This is the first of what I hope will be an ongoing series, reviewing books of potential interest to Mickaboo volunteers and supporters. 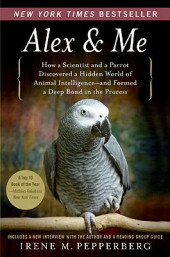 I had intended to pair this review of Alex & Me with one of Betty Jean Craige’s Conversations With Cosmo, At Home with an African Grey Parrot. However, this review turned out to be so long that I decided to leave Ms. Craige’s book for the next newsletter. The number and variety of bird books is vast: scientific studies and natural histories, accounts of people’s experiences with their companion birds, guides to bird care, even novels and children’s books, continue to proliferate. I hope others will contribute to this feature in future newsletters, sharing information and responses to books you have read. Please send any such contributions to pr@mickaboo.org for publication consideration. Be an Angel for One of Our Sweet Birds! Steve Krause Concert Supports Mickaboo! MickaCoo 2010 Review and Thank Yoos and To Doos! 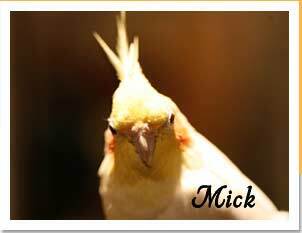 Mickaboo 2011 Calendar Now Available! If you have suggestions about what you would like to see in our newsletter, have articles to submit that you think would be beneficial to our readers, or just want to say you liked what we posted this quarter, feel free to contact our Newsletter Staff.